The August meeting was held at Bob Hollister's garage near Arlington. There were eleven members in attendance. Dave Benny led the meeting. The 2002 Ohio Jamboree was discussed with special emphasis on the location of the Jamboree and some thoughts on what we could do. Tildon Farm was brought up again as a possible destination. The members that go to the event at the Lima Alzheimers Unit have been invited to visit the farm afterward. Before the meeting Bob's project was an attempt to remove a rod through the bottom of the engine. We were able to remove the cap from the bottom of the rod and the bolt on the pin at the top. Unforturnately, we couldn't get the rod to loosen up enough to slide the pin. The #1 rod cap did show an extreme amount of wear and distruction. It will probably be better to pull the engine and check for further damage. To lighten the mood, Bob did a fish feeding demonstration. Holy Catfish!!!! After the meeting, We had homemade cookies, ice cream, and fresh peaches. Thanks to Bob and his wife, Patty for their hospitality. Worth the price of admission! If you're interested in modern bulbs for your T check out this web site. The Model T Automotive Heritage Complex Inc Dedicated the 1904 Piquette Avenue Ford Plant in late July of this year. The plant is located in an area of Detroit that was the birthplace of many of the major automotive companies. The organization invited early Ford models and their owners to the event in an attempt to fill the plant with cars that represented the automobiles that would have been produced at the facility. While the museum will fill the top two floors, they are looking for some old car-oriented businesses to be tenants for the ground floor. Here's an opportunity for someone to move to beautiful Detroit to get away from all of this layed back lifestyle of Northwest Ohio. 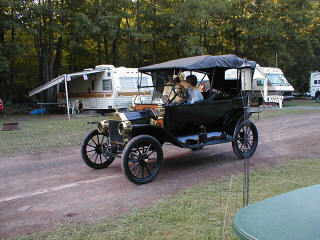 This is a 1906 Model F, owned by Wayne Coffman of Tiffin. Ohio. He was invited to the dedication, but chose not to go. This is a driver that has seen many miles. It now sits, while Wayne drives the bigger Pullman with a dual ignition system You can see the fender and spare tire in the left of the picture. 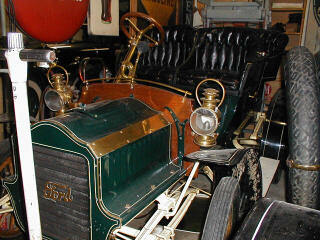 This is a 1908 Model S that was at the Dedication. He and his family just happened to stop by Wayne's home while we were there. The hood is a single piece that is sitting just out of the picture in front of the car. If the picture prints well enough, you should be able to see that the block is two - two cylinder engines that share a common crank and oil pan. 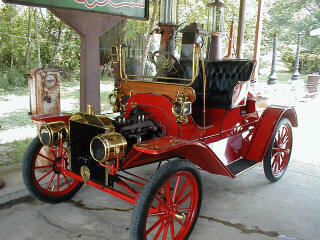 Other than the prototype for the Model T, this was the last model to be produce at the Piquette Plant.. I wanted to relay this experience to the club and at the same time, show the value of being connected to the inernet as an outlet for Model T enthusiasm. I will print the posting and the replies from the MTFCA site in an order that I hope makes some kind of sense. Well it finally happened. While on the last tour, my son persuaded someone to let him drive their car. 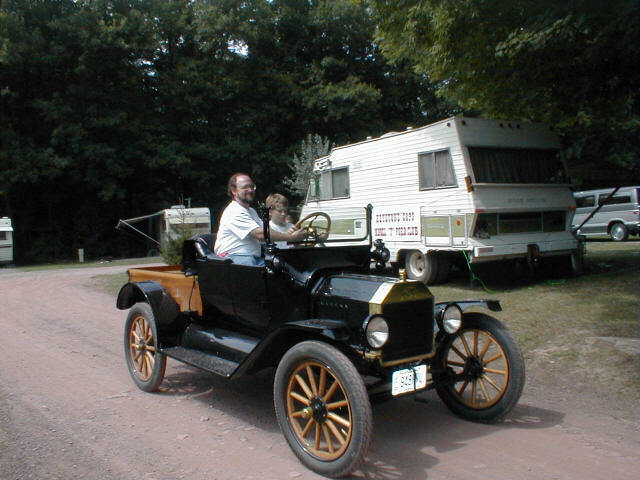 The unsuspecting (brave) soul was Bill Towers and the car was a 1913 touring. As we drove up into the campground in "Old Henry", there sat the touring facing us with Wallee in the driver's seat and Bill sitting beside him giving instruction. Our hearts jumped a little and we yelled to Bill to make sure that he knew that Wallee had never done this before (in spite of what Wallee had probably told him). To make a long nerve wracking story short, Wallee did just fine and made a loop of the campground. My son spent the next 24 hours talking me into letting him drive "Old Henry". I finally let him into the driver's seat after the last day of touring. He had ridden with me on the last leg of the tour and had it all figured out in his head. While everyone was trailering their cars, Wallee and I took a trip down the hill to the staging area to say good-bye to everyone. He was pretty good going down the hill. I did have to drive back up the hill to our campsite. He couldn't get the hang of easing the low band in without stalling the engine. I'm sure that a 10 year old is not the youngest driver out there. Does anyone else have a driving lesson story??? This is a picture of the three span country bridge in Northeast Pennsylvania. This was right before we went up the killer hill. 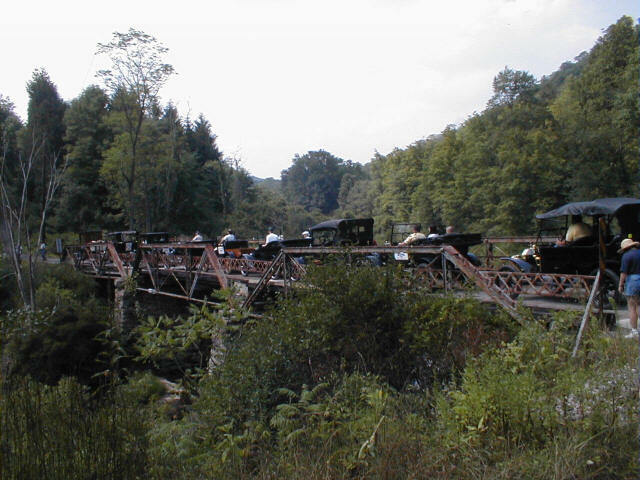 The "killer hill" Jim describes began at the base of this beautiful 1885 iron bridge spanning a waterfall. The hill was about 1/2 mile long and a steep grade on a single lane dirt road. It was great!! It was a tough hill. After I got my car up, I ran down to help push Old Henry up. As I'm running down the hill, I'm met with a sight of marital support that would be tough to beat! Here comes Old Henry struggling up the hill, Jim at the wheel, and his wife RUNNING ALONG SIDE! Every time Old Henry would slow down, she'd give him another push, then run along side till he slowed down again, then give another push, then runalong side some more! All the way up the Hill!!!! That is wonderful. many of the clubs I am in are frequently giving lip service to getting younger people interested in cars, but it seems that most of us are so scared that the kids will damage our car that we refuse to let them around them. I have let many kids hop up in my car and honk the horn while they pretend to drive and not a single one has ever damaged it in any way. Even if they did that is what paint is sold for. I hope it will give some of them that burning desire we all have about "old" cars. As congestion grows, and "open" areas shrink, the parking lots at shopping centers are even too small. "a guy I know" took his daughter to El Mirage dry lake for a day of learning to drive. It has almost no obstacles anywhere. That one takes the cake, but deserts and back country dirt roads come next. Another clue: someone not related does better with your kids than you do. (or your wife! "teaching a wife" might be grounds for divorce.) Go have a beer. Don't watch. When they can reach the pedals and see--it's time to learn. Personally think the kids that have wrecks at 18 are the ones who never learned early enough. We were all driving to school at that age-1944 nobody cared. Narrow mountain roads, log trucks to avoid, roads badly neglected; kids don't get the hazards to avoid today, enough. I hauled oranges to packinghouse while dad was milking. Dad had driven his dad from LA to Palm Springs when he was 10. No way too young to learn. Not to one-up you, but the first car I remember driving was a '36 Chrysler Airflow - at age 4.. My 17 year old brother would let me stand on the seat steer while he did the pedals.. He says we went 100 mph like that. The Ashland cop made my dad sell the car, because he couldn't catch my brother in his Ford. That's fantastic! I got hooked on Model Ts because my Father taught/allowed me to drive very early in life. 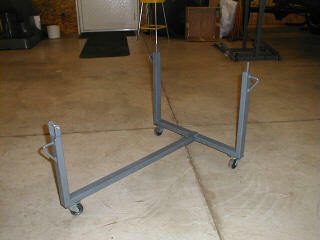 I couldn't start it, but Dad would allow me to drive it up and down the driveway and around the 1 acre yard we had. I was six at the time and I would stand up and just press the low band pedal. I had to wait until I got taller to sit down and put it into high gear. That is the first car I ever drove and is the one I am trying to restore now. I would encourage anyone to find a large open parking lot (grass is even better) and let the kids steer etc. By the way, one nice thing about the unrestored T is you can feel free to let the kids play "Taxi" in it. I spent hours in that T while it was jacked up on blocks. That way the steering actually turns! We flew it, drove it, dove it, depending on if it was an airplane, car, submarine or whatever. Lots of fond memories with that T. Thanks again for sharing your story. Anyone that would like to write an article for the newsletter or present a project at one of our meetings is welcome to contact one of the officers. We'd be glad to have the help. Thanks!!! You'll all get sick of reading about the adventures of "Old Henry" eventually.